BONUS#1: 50% off Ticket to LIVE High Performance Academy seminar! ($997 Value!) HPA is “the gold standard in personal and professional development.” In four transformational days, you’ll learn new insights and habits to dramatically improve your mindset, health, relationships, and career. You’ll unlock levels of clarity, energy, courage, productivity, and influence you didn’t know existed. Signup now and we'll email you details to redeem your ticket for our next event, which is March 14th-17th, 2019! BONUS #2: How To Plan The Perfect Day: What do you do in the morning? How do you plan your afternoon? How do you prime yourself at night to be great with your family while also preparing for a great, restful night? You'll get this bonus in month #2. BONUS #3: Immediate Access to 3 Hours of High Performance Training Right Now! Want insights right now to help you break through to the next level? 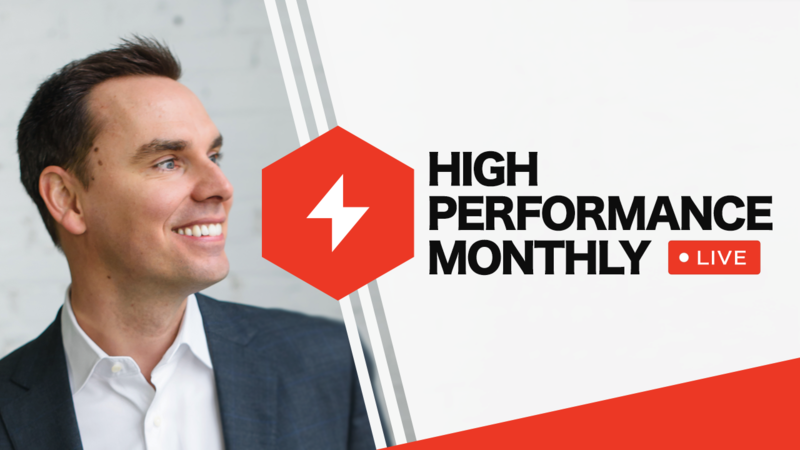 We've put three previous High Performance Monthly trainings in your members area, available immediately upon signup today! You'll get 3 trainings on how to progress faster, remove non-essentails, and finish the year strong! If you don't love the program, just cancel anytime by responding to any of our emails. You can cancel any month and you won't be billed again. However, a cancelation does not refund previous months charges because we delivered for you! Sounds fair, right? Let Brendon train you every month and have your best year possible. You deserve this kind of success training. It's your time. Sign up now for this one-time only offer. If you do not cancel, then in 30 days you will be automatically billed $49 every month until you cancel, which you can do by replying to any of our emails or by emailing us at support@brendon.com. There are no refunds on any prior month, because Brendon delivers all this LIVE, but you can cancel your next month. I understand that when I cancel my subscription, I lose access to the High Performance Monthly online course and all the replays or bonuses within. You get a 50% off ticket to attend HPA LIVE. You must be a High Performance Monthly subscription member for 2 months minimum in order to redeem this bonus. You will receive a free group coaching call with a high performance coach after two months of membership fees have been paid. The group coaching call is via telephone. You can schedule at your convenience via the web link we will send you. You may receive a telephone call from one of Brendon's offices to help schedule your event tickets or coaching call, or to ask about your experience or goals in reaching higher performance.